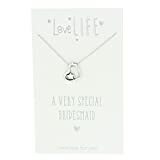 From the Love Life Collection, the “A Very Special Bridesmaid” pendant necklace. From the Love Life Collection, the “A Very Special Bridesmaid” pendant necklace. Makes a lovely accessory for a special bridesmaid. Chain measures approximately 26cm.